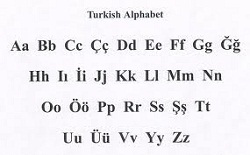 Turkish is the official language of Turkey where it is the native language of 80 per cent of the population. The largest language minority in Turkey are the Kurds who have their own language and are mostly in South Eastern Turkey. Turkish is also an official language of Cyprus. But the largest numbers of Turkish language users outside Turkey are in the Balkans, Bulgaria, Macedonia and Greece. A distinction should be made between Turkish which is the spoken language in Turkey, and Turkic which is the family of languages to which Turkish belongs. The main places where Turkic languages are spoken include Turkey, Iran, Azerbaijan, Kazakhstan, Uzbekistan, Turkmenistan, The Caucuses and Siberia. In addition there are significant numbers of Turkic language speakers in North West China. In terms of language structure, the Turkic languages are similar to each other. Modern Turkish language is a standardised version of the Istanbul dialect. The first Anatolian Turkish language scripts going back to the 1200′s show that the literary tradition of Central Asia was only slightly brought over by the Turkish tribes after conquering Turkey from the East in the Eleventh century. These tribes were influenced heavily by Persian language and Arabic language from the outset of their settling in Turkey because of the higher prestige and development of the culture and language of those neighbouring countries. From the beginning of the Anatolian period, Turkish language was written in Arabic script, until the Latin alphabet was introduced in 1928, one of the many changes brought after the founding of the Republic of Turkey with the goal of westernising Turkey. In the scholarly literature, the Persian and Arabic language components became so dominant that Ottoman became a mixed language, having lost many of its particular Turkic properties to the extent of being unusable as a medium of communication between all social groups. At the same time, however, there was also a lot of mystical literature and folk poetry which was written for the less educated classes, in the language used by those segments of the population of Turkey, namely Anatolian Turkish as influenced very little by Persian and Arabic language. These writings are similar to the Republican Turkish language of today and can be understood without difficulty. After Ataturk founded the Republic of Turkey, he made the “Turkish Language Foundation” which had the goal of “purifying” the language by replacing words from Arabic and Persian language. By banning the these words in the newspapers, the foundation was successfull in eliminating hundreds of Arabic words from Turkish language.